The 2013 MTV Video Music Awards are coming to Brooklyn, and the borough's most influential artist is helping them feel right at home. 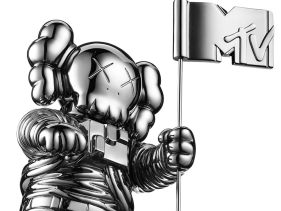 Internationally famous artist and provocateur KAWS has redesigned the VMAs' Moonman award, giving the silver spaceman his first facelift in 30 years. And for a guy who's reinterpreted everything from Mickey Mouse to the Michelin Man, not to mention worked with top brands like Nike and Marc Jacobs, taking on the Moonman was an opportunity he couldn't pass up. "It's such a strong, iconic thing. Everyone sees the Moonman and knows right off the bat what it is," KAWS told MTV News. "When I was first invited to do the project, I knew that I didn't want to create something new entirely, I wanted [to do] something you see that's immediately KAWS and immediately Moonman; people just get it." KAWS first rose to fame in the mid-90s with his graffiti tags and guerilla-style re-workings of bus stop advertisements — he'd literally pick locks to replace ads with his own work — around New York City, but he's lived and worked in Brooklyn for nearly a decade now ("I remember coming over to Brooklyn to paint and it seemed like a playground," he said). And in that time, his bold, street-indebted work has won over the art world and earned him legions of admirers, including Kanye West and Pharrell Williams. He's also crossed over to the mainstream — one of his most iconic characters, Companion, flew in last year's Macy's Thanksgiving Day Parade alongside the likes of Buzz Lightyear and SpongeBob SquarePants — and created a line of vinyl toys, which are produced in extremely limited quantities and are highly sought by collectors. And thatwas another reason he was drawn to redesigning the Moonman after all, this will be a one-time-only affair, making his award the ultimate limited-edition collectible. "That's what I liked about the project; I wouldn¹t want to redesign it for history, I like the idea that at this moment, this first time in Brooklyn, the Moonman's going to change," he said. "I like the fact that, 40 or 60 artists will win this piece, and the majority won't know anything about my work. [And] I'm sure you'll have artists that are mad; they have their perfect chrome line of Moonmen and I've somehow ruined that symmetry ... I love that idea." And KAWS' Moonman definitely stands out. Cast in a striking gun-metal finish, it features several of the flourishes that have made his work instantly recognizable in galleries and on street corners around the world — namely, the comical skull-and-crossbones head and cartoonish gloves of Companion — while, at the same time, remaining faithful to the iconic award that's been handed out to the biggest names in music for almost 30 years. "It seems very in line with the work I make and it sort of seemed like a natural step," KAWS explained. "As I went on [in his career], I got away from doing lettering, and more into using symbolic imagery. The original Moonman was standing on the MTV logo, I took liberties like replacing the footprint; the bones are similar to the bones on the characters I design." Like Brooklyn itself, KAWS' award is futuristic, and yet deeply rooted in the past— and, thanks to its one-time-only redesign, it's destined to bethe most coveted piece of hardware in awards-show history. Who will be lucky enough to take one home? Find out on August 25, when the MTV Video Music Awards broadcast live from the Barclays Center in Brooklyn.